Why smart companies should take advantage of HR’s breadth of knowledge in business decision-making. On the totem pole, HR isn’t usually first when it comes to decision-making in the C-suite. Despite the fact that culture and people are becoming increasingly important factors when it comes to sustainability, businesses often still treat HR as a go-to only when the going gets tough. Staying abreast of social issues such as diversity, gender, race, and ableness falls within the realm of HR. Culture is often instilled by how these values are fostered and treated, and how they are intertwined with the mission and values of an organisation. In the eyes of leadership however, these functions often don’t relate directly to driving the growth or profit of a business so down the pole (along with the budget) HR goes. Less learned and visionary leaders don’t seem aware that these very social lenses HR has developed can keep them buoyant today and well into the future. Let me explain. Disruption, innovation, agility; whatever trendy jargon you want to use. We’re all looking to find clever, low-cost ways to edge us above the competition. Yes, technology often supplies this. 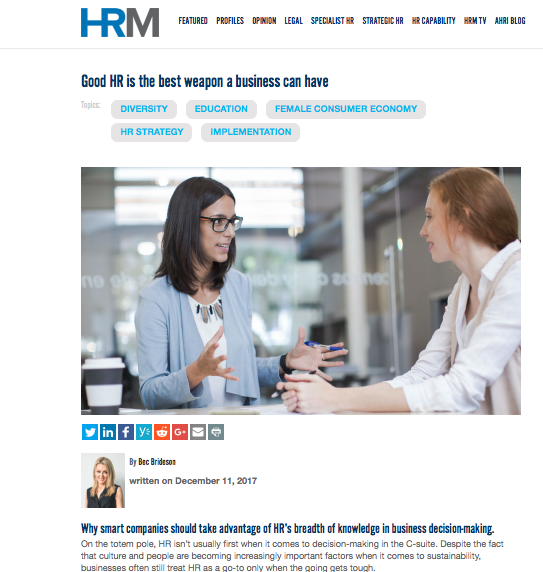 Yet in our hunt for the next big thing to out-think our rivals, we continue to overlook HR’s rich understanding of modern humans, and how this relates externally to a business’ consumers. It’s now widely agreed upon by the likes of McKinsey, Catalyst and EY that diverse teams, and especially boards, produce better financial profits and ROIs. Yet meeting a quota alone doesn’t bring about more profit just as having a flashy automation process doesn’t necessarily mean greater efficiency. It’s dependent upon two additional things: education and implementation. The rise of social issues within the zeitgeist (race, socio-economics, gender) is creating movement. Thanks to the democratisation of the internet, the current is carrying us towards trust, transparency and the making of ethical businesses with higher purposes. Let’s take gender for example. A new $28T global female consumer economy is well on its way full of clever female graduates, disruptive female business owners, and glass-breaking female CEOs – both at home and in the workplace. In a traditional-lensed world where business was built by men, women are becoming enormous contributing participants both economically and socially and HR understands this implicitly. It’s essential for successful HR heads to lead C-suiters towards the water in understanding why this will impact business strategy in the years ahead. More importantly, they can remind us how valuable the considerations of a gender lens could be for innovating your product and service for this powerful, overlooked “blue ocean” market. Consider how educating staff from R&D, marketing, sales, and front-facing operations with the literacy of gendered perspectives could reveal blind spots and uncover opportunity. For over a decade now, beauty care company Dove has been praised for its disruptive marketing, revealing authentic insights into the modern woman. BP recently unveiled a new app for on-the-go petrol payment so you never have to leave your car – perfect for mums with kids. Shebah is Australia’s Uber improvement catering specifically to women and mums that are worried by Uber’s lax concern for their safety. Giant bikes have created a new line for women called Liv that don’t just “pink and shrink” but are geometrically constructed to the measurements of women’s bodies. HR is a game-changer for business in ways that C-suiters and leaders don’t yet comprehend. It’s up to you to build the business case and rewire your leaders’ understanding of HR’s scope as both an internal function and growth driver. It’s time for HR to raze the walls of their business silo and lead the charge towards the bigger opportunity outside its walls.